It is always intriguing to be on testing panel of brands whose products I love using, as it offers glimpses into the creative process that most consumers don’t get before the product appears on shop’s shelves, TV or press ads. Elijah Choo, founder of Bodhi & Birch, is a man who never ceases to surprise me with the depth of his knowledge, but the trio of body oils that he recently launched turned out to be a much bigger revelation than I anticipated. Elijah created an aromatic trio of body oils to celebrate the scent, colour and culture of Europe and offer women (and men) a range of handcrafted products made of 100% natural botanicals and in small batches, thus offering the freshest quality. When I was on a panel of testers, Elijah sent all of us three samples and after using them, we filled in and sent him back a detailed questionnaire. I also talked to Elijah in detail about my experience with the oils, as one of them smelled particularly strong and another I wasn’t too sure of, as generally I am not a huge fan of rose-scented products, possibly finding them a little too ‘girly’. Having said that, this particular rose-scented body oil took me on a journey of such immense discovery, I was completely taken aback – but more on it later. After all of the feedback was in, Elijah continued to tweak and refine the final formulas – always a perfectionist when it comes to his products and making sure they live up to customer’s expectations ! – while also enhancing their unique beauty and wellbeing. Only when he was satisfied, did the products launch and I hope you will find them as transformative as I did. One of my own biggest surprises when it came to those body oils, was a truly successful fusion of aromatherapy and perfumery, so much so, that now I wear two of those oils as a natural perfume, dabbing it on my pulse points, behind the ears and on my neck, after I apply it all over the body. 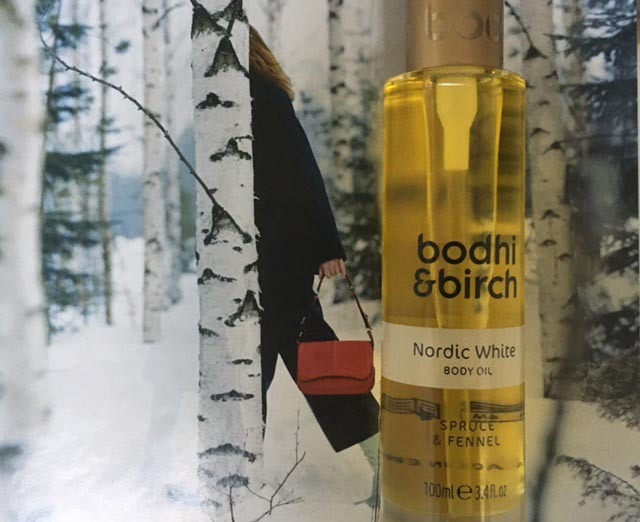 Nordic White Body Oil: the name of this body oil made sure it had me at ‘hello’, and not because ‘hygge’ is the current buzzword. About three years ago, Elijah was in Stockholm, visiting Bodhi & Birch retailers. On his way to one of the meetings, he walked from his hotel, located in central Stockholm, all the way to a more hippie area, where the meeting was supposed to take place. Stockholm is one of Elijah’s favourite cities, as it allows him to walk from one island to another, while observing the beauty of nature, forests and decor of the houses, which he absorbs, nurturing his creative life force. In a way Nordic White is Elijah’s love letter to the city, with an assembly of notes that popped into Elijah’s head as he walked around the city, drinking it in. Original birch notes were taken out, but alpine notes – more wood than leaves, as well as berries, moss, hints of sea and fennel were blended together creating, a ‘fresh, open, balanced white scent’. Elijah had the clearest picture of what this oil should smell and look like out of the three body oils he created , but he went through two versions, before the third satisfied him. Elijah sees this oil as ‘a curative tonic of Spruce, Cypress and Pine enlivened with the freshness of Sweet fennel with soothing undertones of Frankincense. The scent is clean and reassuring, balanced with a soft lingering sweetness’. To that I can add that to me it feels like a hug from an old, comforting friend who knows what to say on every occasion, be it sad or happy. Before I apply it, I warm it in my hands for a few seconds, savouring the smell and then apply it to my body, rolling my fingers over muscles and circling it in when a certain area feels a little tight or painful. I draw comfort from this scent and as my skin warms up from the massage and the scent settles and changes, I end up drawing my wrist to my nose, inhaling it, as the day progresses, in order to ground & center myself. Made with 98% certified organic ingredients , this blend of Safflower, Grapeseed, Jojoba and Starflower oils contains the high levels of Linoleum Acid (Omega 6) and Gamma Linoleum Acid (GLA). It is also rich in powerful Oligomeric Proanthocyanidins Complexes (OPC) – typing this gave me palpitations, as I imagined pronouncing this out loud in front of an audience 🙂 – which helps regenerate and strengthen collagen and elastin structures, thus improving overall skin health. When seasons change and cold starts to nip, dumbness set in & radiators heat up, many of us will find oils particularly comforting, as it will help to draw the moisture back into 7 imparting a subtle glow on it. Interestingly, this oil was the least changed during the formulation process. He also had some initial reservations about the colour, but the lemony yellow colour of this oil, which you can clearly see through the glass bottle housing it, cheers you up on grey days and draws your eyes in when sun rays catch it. I drew comfort from it every time I use it, whether I apply it to dry skin or slightly wet, just right after a shower, to add a little glow to my skin. Elijah also shares a tip of using it as a hair treatment oil: apply a table-spoon to palm (I use less, as I have shoulder length hair) and gently massage from scalp to tip. I tend to keep it on for about half an hour and then wash it off and then shampoo the hair, thoroughly washing it off, until my hair feels squeaky clean. Chinois Blue Body Oil, 100mls, £42: Chinois Blue is a play on 18th century french Chinoiserie, flirting with the European interpretation of the exotic Far East. It captures the heady hues of Hyacinth and Honeysuckle tempered with nuances of Ginger and Blue Tansy to create a sensual Oriental scent. Spicy Gingerly and Pomegranate completes this enigmatic fragrance, softening to a smooth powder finish of Valerian. For Elijah creation of this oil turned out to be a challenge of sorts, because he just had an idea of this oil. Creating it from a dream in his head was another ballgame all together and to top it up, he needed to get the balance of ingredients ‘just right’. If you smell it, it might at first appear easy to you, but it’s not. At the heart of this oil lies the heady and hypnotic hyacinth, but you also have ginger extract, even though you can’t really smell it. You get an overall sharp, zesty, heady smell and if I am honest, this is my least favourite of the three oils in terms of smell. I struggled with it from the beginning and even though Elijah tweaked the final version, I am still not a fan of this smell, yet I know people who adore it. This is simply a question of your personal response to the smell. It certainly bears a deep mystery, as you smell it and it unfolds in your mind, as the lily on the pond. Sicilian Rose Body Oil, 100 mls, £42: creating this body oil turned out to be the biggest challenge for Elijah. It wasn’t the question of ingredient composition – he didn’t need to change them. It was the actual creative process of re-balancing things, in order to create the oil that Elijah felt would delight & surprise rose-loving customers. According to Elijah creating this blend ‘took forever’ and not just the smell, but its variations, as well as the composition of fatty acids & nutrients. He knew his end goal and with that he tuned into key (heart) notes, but modified top and base notes. That’s one of the reasons why I cherish my talks with Mr. Choo – he is a fascinating man, as well as intuitive and encyclopaedic formulator, & I get to expand my own knowledge and understanding of aromatherapy, composition, gardening, plants, to name a few topics, every time I get the pleasure of being in his company. Sicilian Rose is inspired by elusive lemon scented rose that Elijah chanced upon in Sicily. The uplifting scent is supposed to evoke warmth and beauty of the Mediterranean, with an opening burst of juicy lemons (which Elijah toned down) and vibrant verbena, before revealing a floral heart of Rose and Geranium. Add to that a sprinkling of warm Pink Pepper over a dry base of Ho Wood and you will have a complete, exuberant scent journey. This body oil, for me personally, is a perfect example of unifying aromatherapy and perfumery and according to Elijah, ‘it’s like orchestrating a perfect symphony. When I talk to Elijah I can lose hours, because his knowledge is so vast and fascinating, yet he makes it simple for the inundated, so you drink his words in, not feeling out of your depth. I am generally not an avid rose lover when it comes to perfumes or skin or body care, but this body oil took me on a journey of self-discovery because while I liked it, I never thought I would be completely smitten with it. Since I tried the final version of this oil, I savour it like a glass of a rare elixir, as notes develop on my skin, spurred on by the skin’s warmth. The actual science of smell offers an interesting dynamic – our sense of smell gets ‘bored’ easier, than our sense of hearing for example, and we have no control over it. We inhale and within seconds know if we like or hate the smell, as simple as that. When Elijah works on the products, he does so while there is progress, then he let’s the product be and comes back when he feels ready, armed with a fresh prospective on further creative journey. It does take time and patience and sometimes leaving something for longer makes the end result better. Elijah also makes sure he elevates and enhances key ingredients, thus making them more prominent and letting the products spark, bringing science to the surface. I love the honey and lemon undertones of this oil and how it makes me feel very womanly and content, once it develops on my skin. While this oil nurtures and adds radiance to the skin when it becomes lacklustre, the fragrance journey that it takes, once it comes in contact with your skin, develops into something completely unexpected, giving you a sense of childish wonder when opening a surprise, thoroughly wrapped up in layers, gift.